Wow, these Strawberry and Maple Scones are so delicious for a fall morning sweet breakfast! When I first changed my diet and started to wean off sugar and candy treats, I thought it would be quite impossible to bake all the wonderful pastry recipes that I had grown a fondness for. I thought all gluten-free, dairy-free and refined sugar free desserts would taste like cardboard. These scones prove my healthy baking misconceptions wrong! They are fluffy, light and full of delicious flavor coming from the caramel maple syrup, strawberries and sweet currants! The underlining cinnamon and nutty oat flavors bring warmth to the scones that are perfect for a fall pastry. It really tastes like a hearty oatmeal raisin cookie! I’ve had many friends sample the scones and they all adore this simple and delicious treat! 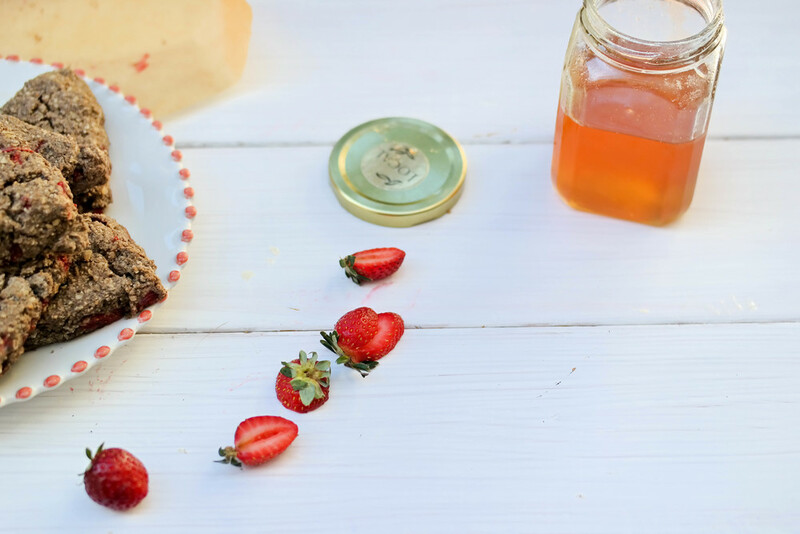 I love to add toppings to these scones with a spread of nut butter and a drizzle of honey for the most delicious and healthy breakfast. These scones have an abundance of nutrients from the gluten-free oat flour, strawberries and currants! I often add currants to baked goods, oatmeal and even salads because they offer a sweet flavor but are also full of wonderful health benefits! Dried currants are a lovely fruit option in the colder months as they are readily available and are low in fat and high in protein. They are also an excellent source of both soluble and insoluble fiber. Soluble fiber is an important aspect to fiber as it slows down digestion, which makes you feel full and can aid in weight loss. Insoluble fiber is just as important as it helps regulate bowel movements, adding a laxative effect, preventing digestive problems. If you don't have fresh strawberries on hand, just add another handful of currants and they will taste just as scrumptious. I hope you enjoy these scones this weekend or get a chance to bring them along as a lovely treat to any upcoming holiday brunch party! Start by preheating your oven to 420F. Place all the dry ingredients into a large mixing bowl and stir until combined. Then add the coconut oil and with a pastry cutter or fork, cut and mix the coconut oil into the oat flour mixture until a crumbly dough forms. Place this mixture to chill in the refrigerator for 10 minutes. Once its cold, add the strawberry pieces, currants and slowly add in all the wet ingredients. Slowly mix the dry and wet ingredients together until combined - careful not to over mix. On a baking sheet lined with parchment paper, form a circle out of the dough - it should be about 1 inch thick. Cut into 8 triangular pieces and bake for 15-17 minutes. Enjoy with jam, a drizzle of honey or nut butter!